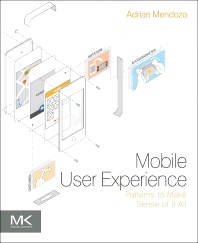 This is your must-have resource to the theoretical and practical concepts of mobile UX. You’ll learn about the concepts and how to apply them in real-world scenarios. Throughout the book, the author provides you with 10 of the most commonly used archetypes in the UX arena to help illustrate what mobile UX is and how you can master it as quickly as possible. First, you’ll start off learning how to communicate mobile UX flows visually. From there, you’ll learn about applying and using 10 unique user experience patterns or archetypes for mobile. Finally, you’ll understand how to prototype and use these patterns to create websites and apps. Whether you’re a UX professional looking to master mobility or a designer looking to incorporate the best UX practices into your website, after reading this book, you’ll be better equipped to maneuver this emerging specialty. Chapter 2. Why Mobile UX, Why Now? Step 3: Draw on Them! Adrian Mendoza’s career is highlighted by over twelve years of design and user experience in the handheld, pharmaceutical, financial, and educational sectors. His first studio, Synthesis3, worked with several Palm OS software companies in creating a brand for web and retail prominence. In the financial and education sector, customers included Sovereign Bank, Houghton Mifflin, MIT and Harvard. Adrian consulted as a UX Expert and in Information Architect lead roles for Fidelity’s E-business design group, Thomson Financial, Razorfish, Sapient, and T. Rowe Price. Adrian earned his BA from the University of Southern California and his Masters from the Harvard Graduate School of Design. partner at Mendoza Design, a Boston-based UX and design consultancy; and is a co-founder of Marlin Mobile a user experience, optimization, and performance company.